To Sum It Up: Sophronia is excelling at her studies in all things espionage at Mademoiselle Geraldine’s Finishing Academy for Young Ladies of Quality, so much so that her friends start giving her the cold shoulder. As if that weren’t enough to cope with, Sophronia finds herself the center of particular attention from Lord Felix Mersey, one of the visiting students from Bunson and Lacroix’s Boys’ Polytechnique. Someone also seems intent on harming the Plumleigh-Teignmott siblings, and Sophronia is determined to uncover the culprit. Review: This is my seventh excursion into Gail Carriger’s wonderful Victorian world of steampunk, vampires, and werewolves, and I never want to leave. Ever. 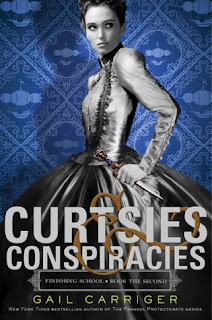 I have entirely too much fun when I’m ensconced in the pages of her books, and Curtsies and Conspiracies was a riot to read from beginning to end. I don’t often find myself laughing out loud while reading, but let me tell you, I LOL-ed my way through this one. The plot here is beefed up a bit from Etiquette and Espionage. Sophronia, always on alert for something amiss (which is why she’s an ace intelligencer in the making), fears for the safety of her dear friend Dimity Plumleigh-Teignmott and pieces together a nefarious scheme that only Sophronia, of course, can thwart. Her escapades on board the airship that houses Mademoiselle Geraldine’s Finishing Academy for Young Ladies of Quality and later in London feel more cohesive than they did in the previous book. That’s not to say that there aren’t a few plot details that could have benefitted from some further fleshing out, but on the whole, the plot stays on course. The character development in Curtsies and Conspiracies is spot-on. I love Sophronia as a heroine, even more in this novel for showing flaws that bring more of a balance to her character. According to her first school evaluation, she’s prime intelligencer material, but she needs to work on her social skills. Sophronia quickly feels the harsh truth of this when the other girls start ignoring her because she’s too good for them. The sting of ostracism especially hurts coming from her friends Dimity, Sidheag, and Agatha. Sophronia also gets a little overzealous with a mission that results in some serious consequences. The latter incident, which turns out not to be entirely Sophronia’s fault, still leaves her feeling guilty and with a new appreciation for not throwing all caution to the wind all the time. Romance takes a step to the forefront in this book and even displays signs of heading into love triangle territory. So far I’m not put off by it because I have so much trust in Carriger’s skills. Just for the record: Team Soap! I can’t emphasize enough how delightful the humor in Carriger’s books is, and I especially enjoyed Curtsies and Conspiracies. The characters’ various idiosyncrasies combine with Carriger’s vibrant prose to make these novels very addictive. You can’t wait to see what sorts of capers these characters will get into next, and that’s exactly my sentiment toward the next installment in the series. All in All: I’m totally in love with the Finishing School series. I also love the references to Gail Carriger’s adult Parasol Protectorate series, but even without those, Curtsies and Conspiracies is an amazing read in its own right. Yay, I'm glad to know you found such enjoyment in the follow up of Curtsies and Conspiracies. I LOVE LOVE LOVE books that can make me LOL or can draw me in enough to make me feel what the MC is feeling. Sounds like Sophrenia goes through a tough time with her friends this go round. But it's cool that the author used the situation to highlight her shortcomings and round out her character. I hope the next book is just as enjoyable as the first two, Happy reading! This was such a great sequel. I don't care for characters who are too perfect, and Sophronia has just enough flaws here to show that she's human. And these books just never fail to make me smile! I so enjoyed the first book, that I can't believe I haven't picked up the second one yet. My friend loves the audiobook version though, so hopefully I'll just listen to it soon. I'm so glad the series continues to grow and is still so delightful! I love that the Parasol Protectorate books also show up a bit in this too - I hadn't started reading the series before I read Etiquette & Espionage, so I had no idea of the world (does the other series get a mention in Etiquette?). Yes- there are some subtle references to the Parasol Protectorate in Etiquette and Espionage! I really love how the two series are tied together but yet stand out on their own. I hope you get to listen to this in the near future- I bet it's even funnier with narration! I'm glad you have all of these ready to go, too! I grabbed them when they were on sale, and it's been awesome being able to just read one after the other. Unfortunately, I've reached the end of what's available and am trying not to think too hard about having to wait for the final book, lol.